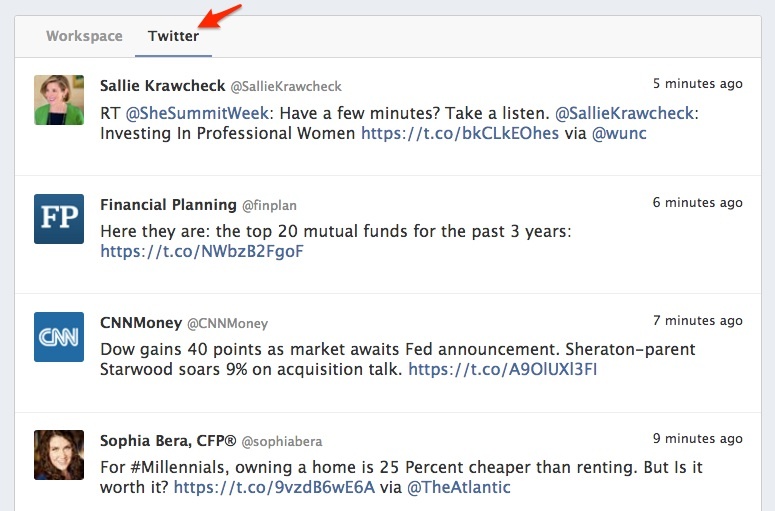 The Twitter tab shows “read only” real-time activity streams of your Twitter feed if you’ve chosen to link to your Wealthbox account. There are two options to consider when integrating your Twitter account to Wealthbox. The first option is to only view feed activity of the social media account. This is helpful to monitor life events of prospects and clients. The second option is to not only monitor your social network feed within Wealthbox, but also to import all contact names and headshots from this respective social network into Wealthbox. Note: If you have not imported your client details, you may want to wait to import the Twitter contacts as they will be seen as duplicates if you import a more detailed file later, therefore, will skip and not import the additional details for those clients. Under “My Integrations” choose Twitter. Log into your account when prompted, giving Wealthbox the authorization to import the feed. Navigate to the “Contacts” page from the left navigation panel. Click “Import” from the right side panel.